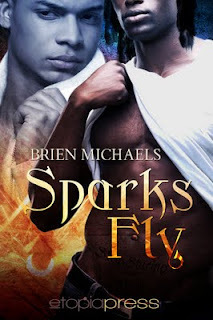 Today we've got a guest post from brand new author Brien Michaels, and he'll be giving away a copy of his first book SPARKS FLY to one lucky commenter. Thanks for being here, Brien! We may be many many things in our lives, but there’s only one thing we are before we are writers. And that’s human. And as humans one thing gets in the way of our writing time after time. Emotions. And other writers can vouch for me with this. You can get everything together and be pumped and primed and ready to hammer out two thousand words or finish that WIP that’s been niggling at you for weeks now, or any number of things related to you getting words on that page. I’m more of a pantser than a plotter so everything I write is influenced by my emotional state at any given time. So I find that when I get in one of those really funky moods, the best possible thing for me to do is write. It’s not even so much of writing the reason I’m upset, but having something else to channel all of that negative energy into is huge. And once I’m done, I feel loads better. My characters might hate me, or some poor schmuck (on paper, of course) may be a bit dead, but at least that negativity isn’t still inside, eating away at me. Emotion is one of the most powerful things we have as writers. We’re trying to make the reader laugh or cry or scream or all of the above, so why not do it ourselves? I actually started using my emotions to write a couple years back with this story that was (then, anyway) called Darkness Round The Sun. It was the story of two guys who fell in love with each other, even though one of them was from a family of total religious zealots. I was totally broken, for some reason when I sat down to write the opening paragraph, and that brokenness translated onto the page and still to this day people tell me it’s the best opening I’ve ever written. I was in a really dark place when I wrote it and I think that’s one of the reasons the story is as dark as it is. But besides dark, it’s emotional. It’s thrilling and it’s heartbreaking and it may just be a tear-jerker, but it wouldn’t be any of those things without the emotion I had to work through and onto the page. Even with SPARKS FLY, I had to work through this mass of irritation so it could be written because there was so much…crap surrounding its conception and writing. I won’t bore you with the details here, but just know that I almost gave up during the process of working on that one. The important thing, though, is that the reader is going to feel what you feel. One of my pals on Twitter told me a few weeks ago that if you get bored with your story, then the reader will get bored, ten-fold. So why not give yourself over to the emotions you want them to feel? I promise you, it’ll make the book better. So even though the epic contest is over, I’m gonna do a giveaway here, just because Shoshanna is so awesome. One commenter is going to win a copy of Sparks Fly today. *****Just leave your email address and preferred format and I’ll choose the winner with the help of random.org at midnight. When Eduardo Harvelle meets Lincoln James on board The Miracle, a cruise ship promising to take their all-male passengers to meet the last woman in existence, sparks fly. Literally. Sparks surround strange unexpected passenger deaths like an aura. When the corpses start turning up wherever Lincoln happens to be, all eyes turn to him. Could the only man Eduardo has ever allowed himself to have feelings for be a murderer? Or are there more sinister forces at work aboard the Miracle, and beyond...? Sparks Fly is now available from Etopia Press as well as All Romance Ebooks, Amazon Kindle and on the Nook. Thanks, again for having me, Sho! Thanks again for having me, Shoshanna! Hi Brien - So true about the influence of emotions! Thanks for the interview, it is always interesting to read how a writer works and how real life can affect the story. And the winner is Maddie A! Congratulations! I'll get the book out to you tonight. Thanks Brien! Congrats Maddie A! Trying again to see if they'll let me post here. Brian congrats on your first novel. This comes from an old writer who has beenpublished for some 40 years.